This photograph of the historic 'Investigator' tree was taken in 1871 at Sweers Island in the Gulf of Carpentaria, during the term of office of G.F. Sandrock as Sub-collector of Customs for the Gulf District (1866-1871). 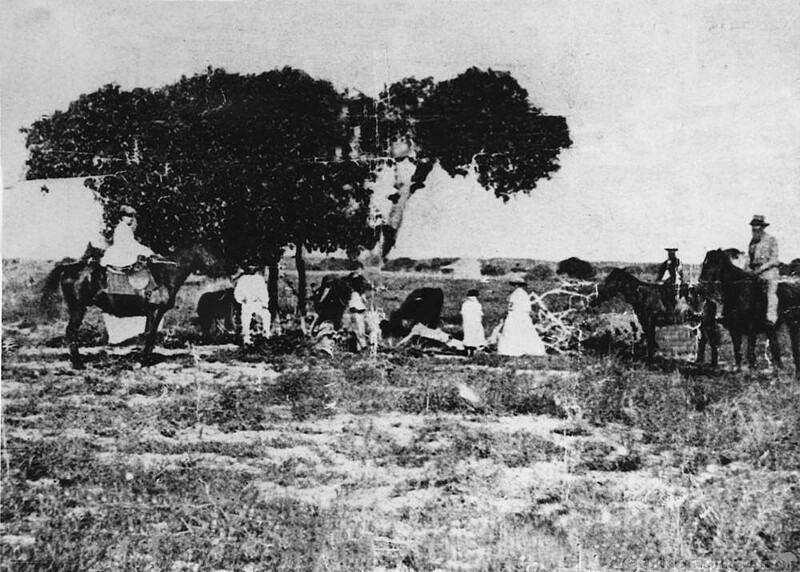 In the photograph he is on horseback, second from the right. His wife is on foot in front of him, and his daughter, afterwards Mrs B.A. Kent, is on horseback at the left of the picture. Portion of the tree is now in the Queensland Museum. G.F. Sandrock was transferred to Bowen in 1871, where his daughter married B.A. Kent, father of G.E. Kent, founder of the Bowen tomato industry, whose descendants still reside in Bowen.